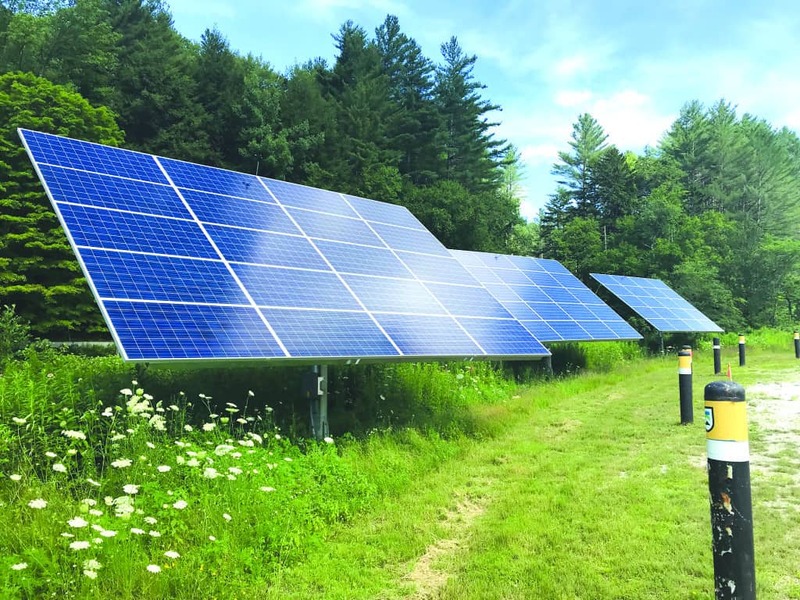 KILLINGTON—Much of the regular July 16 Select Board meeting concerned the impending contract with AllEarth Solar of Williston for installation of a net-metering system to serve the town offices’ power needs. Bob Vittingl, a consultant for Apex Solar, the installer, was present. Before the meeting, board members Vittingl and Town Manager Chet Hagenbarth toured the proposed locations of 18 solar tracking panels: three behind the town office, three in the apple orchard behind the Killington Road soccer net, a row of three along the stream by the new library, and three each in the areas of the old library, the town garage and the transfer station. Vittengl explained that each unit is about 20 feet tall when upright, and 11 feet tall when lying flat. They are identical to the units at the Skyeship gondola on Route 4. Much discussion in the meeting centered on the terms of the agreement and how to ensure the town is getting the maximum value. Hagenbarth summarized the agreement’s terms and the advantages of the proposal. The agreement states that annual solar energy production will be about 175,000 kilowatts. The trackers will supply more power than needed, he said, resulting in the town getting credits back, or 19 cents per kWh from GMP. There would be no net cost. The monthly fee for the equipment is $2,500. According to Hagenbarth’s calculations, the town will be paying $30,000 per year for the PPA agreement and will receive $33,333 for what it’s producing for power, resulting in a $3,300 credit from GMP. “This way we are fixing our costs and have control of our power consumption and production,” he concluded. Select Board member Jim Haff said he had read something that said GMP was only paying 4 cents until 2016, and he said he wanted to see a letter from GMP that specifically states that the town’s account will be credited for 4 cents per kWh: 1 cent in the net metering and 3 cents in return for giving up the Renewable Energy Credits. Haff also expressed concern for underproduction that could sacrifice the economic advantage with a set monthly invoice and asked why couldn’t the town be billed just for what it uses? Vittengl replied that it can’t be micromanaged due to the frequent changes in weather. The system still produces in the winter, and Summer Solstice is the peak. Then it varies up and down from that point. Hagenbarth pointed out that to begin generating this late in the season, the town will lose out until the end of the cycle. “Basically we are prepaying for the power,” McGrath put in. Vittengl added that the installation schedule can be expedited. The proposal applies only to power generation for town buildings and infrastructure. Private homes, buildings, facilities and businesses may install their own solar and arrange net-metering with GMP, Hagenbarth clarified in a follow-up interview. The installation of 18 solar panels were discussed at Killington’s most recent Select Board meeting.